Transportation services operates over 170 bus routes that deliver approximately 4,500 students to school every day. Prairie Valley buses travel over 27,500 kms each day - that is more than 5,060,000 kms every year! Two bus maintenance shops manage the needs of the fleet - the Regina Shop operates in our facility at the Education Centre in the RM of Sherwood and a satellite shop is located in Grenfell. If you have questions about busing or transportation of students please call (306) 949-6566 or 1-866-488-4788. The phone number for the Grenfell Bus Shop is (306) 697-2441. Prairie Valley School Division is committed to delivering safe and reliable transportation services to students. In doing so, we are guided by school division policies and procedures. If you have concerns or questions regarding your child's transportation, please complete the form posted below. Concern forms are reviewed regularly and you will hear back from us within a week. If your concern is an emergency please contact us at the phone numbers listed above. Prairie Valley School Division is committed to delivering safe and reliable transportation services to students. The Division follows a procedure for bus service cancellation for inclement weather. Decisions regarding a Division-wide bus service cancellation is made by the Director of Education in consultation with the Supervisor of Transportation based on the 6 a.m. Environment Canada reports. Due to the geographic size of Prairie Valley School Division, bus services may vary from location to location. The Environment Canada weather tower areas are listed below. severe cold weather temperatures of -40 Celsius or colder without a wind chill factor as of 6:00 a.m.
severe cold weather temperatures of -45 Celsius or colder with a wind chill factor as of 6:00 a.m.
unsafe or extremely adverse road conditions caused by ice or drifting snow. If weather conditions do not meet the above criteria for a Division-wide cancellation, bus service may be cancelled by individual bus drivers due to severely limited visibility, adverse road conditions or mechanical issues with the bus. The School Division respects the right of parents or guardians to keep their children home during severe weather conditions, or when, in their opinion, the safety of their children may be in jeopardy. Families will be notified of cancellations by telephone, by listening to local radio stations, and by checking this website or the school website. If buses are cancelled, notices are posted to this website and school websites by 6:30 am. For more detailed information, view the Bus Service Cancellation - Inclement Weather Procedure. All drivers are required to complete two emergency evacuation drills each year. To find out more, click on the link below. 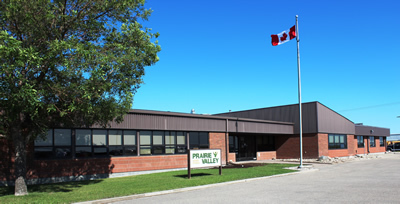 Effective with the 2019-2020 school year, students who reside in the Regina Attendance Area, the Grand Coulee Attendance Area and the Pense Attendance Area (as define by Prairie Valley School Division) will be transported to Prairie Valley schools with the exception of those students who cannot be accommodated within Prairie Valley’s French Immersion program. Click here for more information.